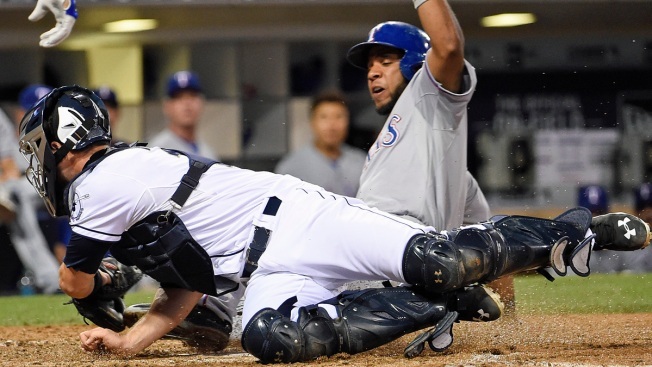 If you stayed up late last night to watch the Rangers beat the Padres, you were treated to one of the most fun, fascinating and fleeting plays in the game. Much more rare than the no-hitter and the cycle, Elvis Andrus pulled off a successful straight steal of home plate. How unique was his feat? In a sport that tracks and invents statistics for seemingly every play, non-play and hat adjustment of every game over every season, there is no official stat for steals of home plate. What Elvis gave us was a Unicorn beating Bigfoot in a race to the Star Trek Enterprise. So rare, it bordered upon mythical. Even more impressive, it came against a right-handed pitcher. Who was working from the stretch. I know, sounds impossible. A pitcher pointed directly toward the runner only has to spot the runner, then calmly step and throw to the catcher for an easy tag. How can running 90 feet be faster than throwing 60 feet? Sure there are steals of home plate, via the double-steal, a botched squeeze bunt or even a misplayed pick-off. But the straight steal is the most daring, wonderful and exciting play in the game. It takes guts to try it, timing to give it a chance and wheels to make it work. Speed plus savvy. Throw in an oblivious pitcher and – voila – Elvis stole home. In the 7th inning Andrus singled in a couple runs to extend Texas’ lead to 7-4. When San Diego inserted reliever Kevin Quackenbush, he knew it was the perfect time to gamble. Inexplicably, Quackenbush put his head down as he slowly moved into his stretch. Before he looked up, Elvis was 2/3rds of the way to the plate. Visibly shaken, the pitcher quickly strode and threw to the plate but wide to the left side of home, allowing Andrus to slide safely under the tag. Elvis has now stolen home four times in his career which, by today’s standards, makes him one of the industry experts. You want rare? There have been six no-hitters in baseball this season, including three last month. There have been four players hit for the cycle in 2015 including two Rangers. But straight steals of home? Again, exact records are difficult to pinpoint because a successful steal is awarded to double-steals, botched squeeze attempts, etc. But as far I can tell Elvis is the first to successfully steal home this season. There were two in 2012, one in 2013 and none last year. The Red Sox, for example, have only had five successful straight steals of home since 2007. And from 2000-09, there were only 15 successful attempts. The last Ranger other than Elvis to successfully steal home? Scarborough Green in 2000. It’s a far cry from the days of big, windmill windups, when methodical and mechanical pitchers took so much time delivering to the plate that steals of home were commonplace. Ty Cobb stole home 54 times. Jackie Robinson 19 times. Even Babe Ruth turned the trick 10 times. They say if you watch baseball long enough you’ll eventually see something new. Short of the Rangers winning their first World Series, Elvis’ straight steal of home will be the most rare and rewarding sight of the season.